Gotta love the Hydro Fair! We had so much fun! Rosson & I on the carosel! Rosson really wanted to ride the big ferris wheel! Gavan took both the big kids on it & they loved every minute! Jaylen, Rosson, Ethan & Owen on the airplanes! Wow, this little guy is already 8 weeks old! He is an awesome baby & is sleeping great....very close to all night long! He started smiling at us, especially his big sister. Not sure how much he weighs but he goes to the dr next week so we'll see....I'm sure he's not measuring up to his brother. Ready for church...first time wearing shoes! This big sis & big bro have adjusted so well to Mr. E & completely accepted him into our family without any jealousy issues. We have had such a smooth transition to #3 & feel so very blessed. Actually with all the major changes in our lives over the last 2 months, our entire family has adjusted much better than I thought we would. We are settling into our new town, church & life in general & really liking it! I can't help but think that these times are passing by me so quickly & I need to really slow down to soak everything in. These 3 will soon all be in school before I know it. Easton is already 1 month old & he is such a sweet guy! He's eating & sleeping so well......like only waking up once to eat during the night. We're hoping this keeps up & he slowly just stretches himself out to sleeping all night....fingers crossed. He still sleeps tons during the day but during his awake times, he's focusing in more on us when we talk to him. He's still wearing newborn clothes for the most part but those little cheeks are definitely filling out. He's lost some of his hair but still has quite a bit & it still stands straight up, which I love! Easton Brooks Byrd is here! Our sweet little man came into our family on May 16, 2012 weighing 7 lbs. 14 oz & was 21 inches long. He is just perfect & has an awesome head of hair! We couldn't feel more complete or in love with our littlest guy! The rocking natural mohawk.....already attracting all kinds of ladies! I had a wonderful baby shower a few weeks ago for the little man. I was so excited to get lots of diapers & wipes....with the 3rd one it is all about the necessities! Me & Sue.....I've taught Sonshine School with her for over 4 years! Love her! Me & Mandy....we are always pregnant together! This time we are 3 weeks apart. Heidi & I....pregnant again together. This time just days apart with our little guys! My hostesses! Love you girls! Oh my goodness.....that coffee punch was SOOOO delicious! The yummy spread......I enjoyed a little bit of everything! I didn't take any pics of the gifts I guess! Loved everything we got & felt truly blessed to have such great friends & family helping us get ready for Easton to join the world! 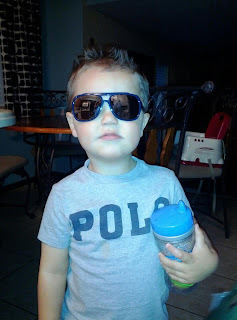 This guy loves sunglasses but Jaylen & I are tired of him always wearing ours & breaking them too. I finally found a pair that were pretty flexible & ones I thought he wouldn't break within the first 5 minutes of getting them. But all we can think about when we see him with them on is Carlos.....yes, that's a Hangover reference. This picture of him just cracks me up for some reason.......just love my little man!